You want to know what the most terrifying aspect of human existence is? It’s the past. I know that plenty of people will argue that the future is more terrifying, but the great thing about the future is that it’s up to you as a individual to decide what your future will be. The past is cemented, something that never change and depending on the kind of person you are, it can dominate the state of your well being. Warning the following review will contain spoilers, so remember to read your comic before reading this review. You have been warned. Before I opened up this issue, I assumed that we had learned all we needed to know about Jessica’s trauma. Trauma isn’t something that doesn’t just disappear and while I’m glad that aspect of PTSD has been reflected within the series but at some point for readers you don’t want aspects constantly brought up over and over again. Even though this chapter does focus on said Trauma, Seeley opens up a door that I forgot even existed. What exactly caused Jessica’s trauma? Sometimes the most engaging stories are the ones that are right in front of your face. Now Seeley did tease this at the end of the previous issue, so it’s excellent to see him immediately follow up on it. Seeley teases just enough to satisfy readers, but doesn’t reveal the origins of Cruz’s trauma. One of the more interesting ideas to play with superhero comics is their morality. With a few exceptions, DC heroes vary rarely stray that morale line. Heck one of the more famous ones involves Hal killing the entire GLC, and it’s institution. 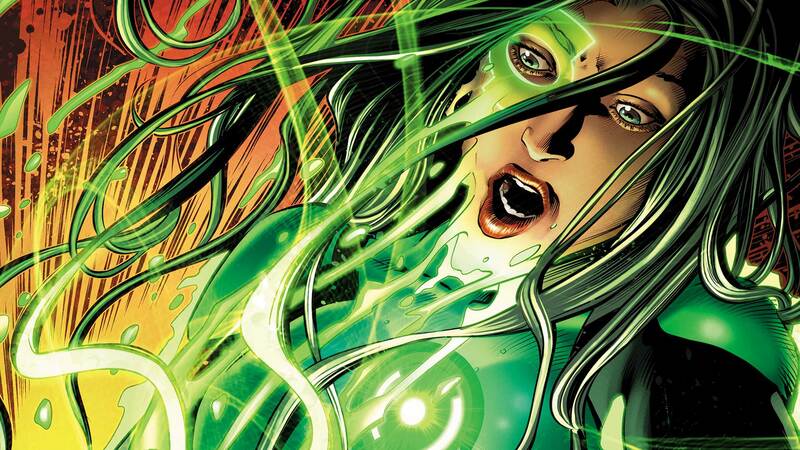 Which of course brings us to Jessica Cruz as she struggles to remember the events that caused her trauma. The conversation between Jessica and Calamity Jaine felt like it was ripped from Jesus talking with the devil in the desert. The temptation that Jaine puts in front of Jessica oozes with intensity, not only because of what Jaine is offering but the fact that you can see that Jessica wants to know. It doesn’t make Jessica weak or less of a character as she contemplates what Jaine is offering, it in fact humanizes her even more. After all who wouldn’t want to know why they can’t remember a traumatic event? Even though Simon Baz does take a bit of a backseat for this chapter, him dealing with a giant robot who’s fighting a custody battle was a very fun sequence that shockingly had a deeper subtext than one would expect. It’s only a battle sequence but it serves as a release from the tension between Jaine and Jessica and it worked. Ronan Cliquet’s artwork was once again spectacular. With a issue like this the artist needs to be able to convey emotions precisely. Cliquet perfectly captures the roller coaster of emotions that she’s going through. I know that storytelling is the last thing that most comic readers will reflect upon when examining a page, but it’s the most crucial element that holds a comic together. While Cliquets art won’t immediately grab you but once you look deeper you’ll see why his art is great. Not only that but Cliquet’s action screams excitement, it’s bombastic and loud, it’s what you would want when reading a comic book. Green Lanterns #44 definitely opened up the door for something that can be really compelling. It’ll be interesting to see what Seeley has in store for Jessica’s personal psyche as this arc goes forward.